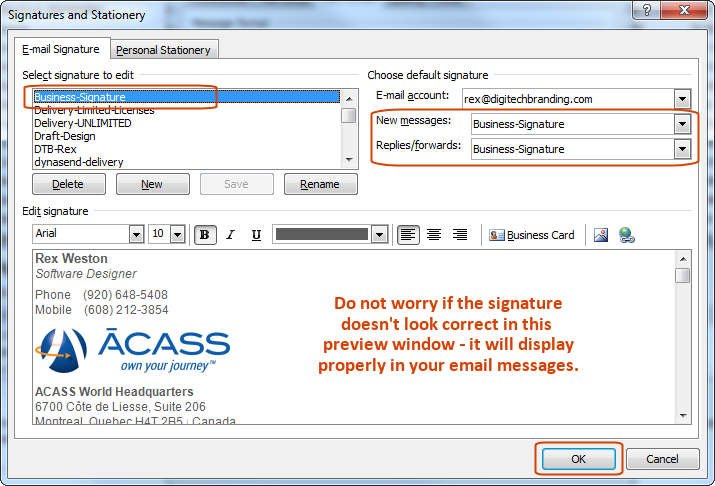 Attention: Before proceeding you must have your new email signature displayed in a browser - click the link to your signature that has been provided. 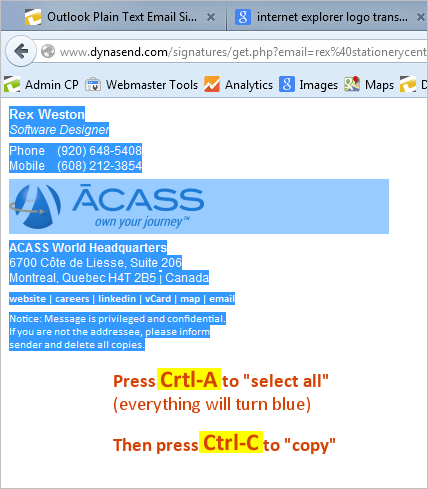 Your email signature will open in a browser window. 1. First, click the link we have provided to display your signature in a browser. 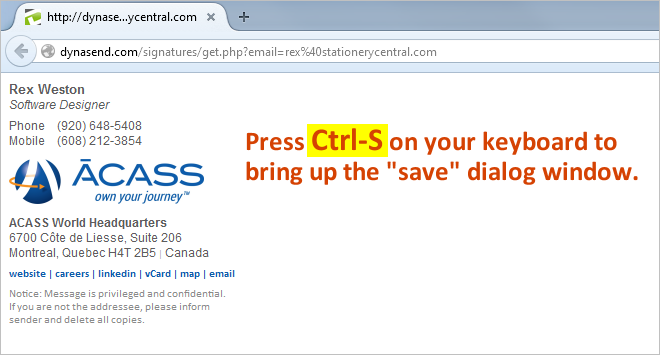 Press the “Ctrl” key and the “S” key at the same time - Ctrl-S - this will bring up a “file save” dialog window. 2. 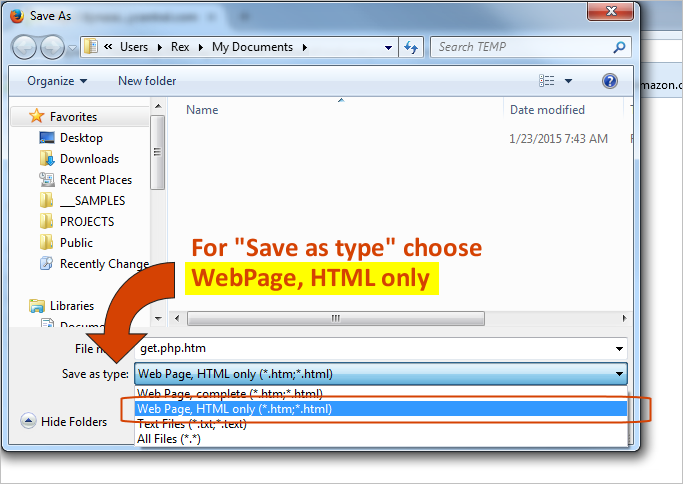 Under “Save as type” choose “Web Page, HTML only”. Do not choose “Webpage, complete”. Click “Save” to save the file. 4. Now you should be back to seeing your signature in your browser. Press Ctrl-S, which should reopen the “file save” dialog window. Locate your signature file in the folder. RIGHT click on it and choose “ Copy”. Close the “Save As” dialog box. 5. 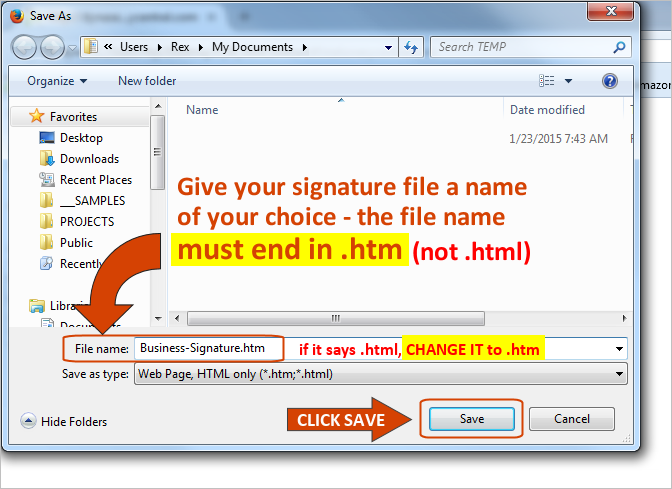 Leave the browser window with your signature open. At this point you’ll see the “Signatures” button - HOLD YOUR “CTRL” KEY DOWN AND CLICK THE BUTTON AT THE SAME TIME . The folder that stores your signatures will open. 6. 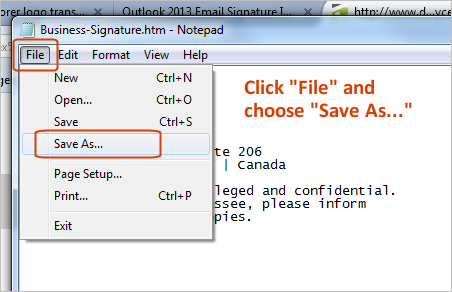 Press “ Ctrl-V” or RIGHT click and choose PASTE to paste your signature file into this folder. 8. You’ll now see the signature you just saved in your list of existing signatures. Set this signature as your default signature for new messages and for replies, save your settings and exit the signature dialog. You’re now finished installing the HTML version of your signature. 9. Go back to the browser where your signature is being displayed and press Ctrl-A - this will turn everything blue. 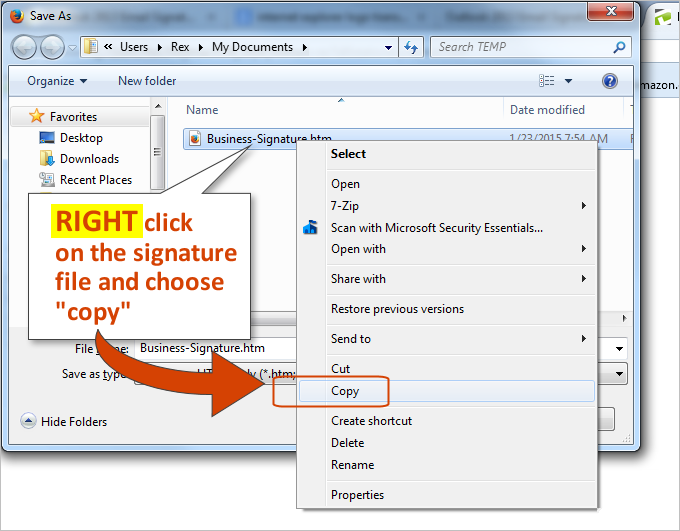 Press Ctrl-C to copy the signature to your clipboard. 11. 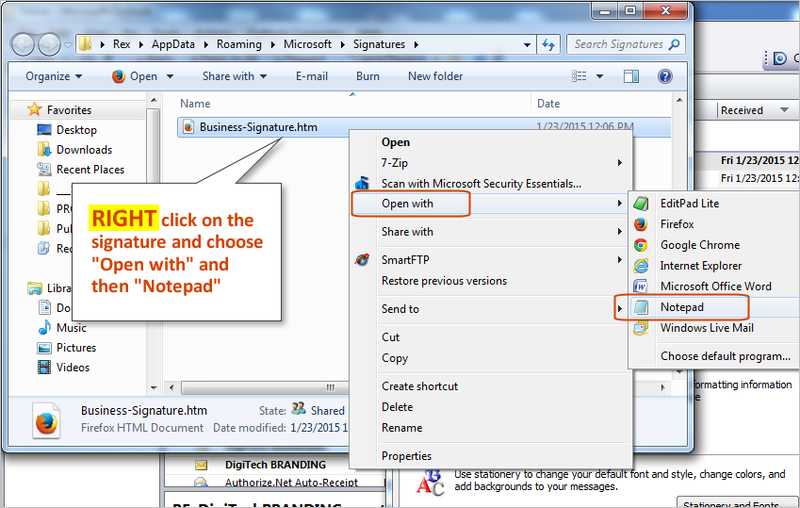 Locate the signature file you just saved and RIGHT click on it and choose “ Open with” and then choose “ Notepad”. 12. Now you will see all of the computer code for your signature. Press Ctrl-A - this will turn everything blue. Then press your “ DELETE KEY” and everything in the edit window will disappear. Place your cursor in Notepad’s edit window and press Ctrl-V to PASTE the signature (which you copied in step 9) into Notepad. 13. What you new see is going to become the “plain text” version of your signature - it will appear when you REPLY to an email message that was originally composed as a plain-text message. This signature will not appear for you very often, but you should now clean it up so that when it does appear it looks good and has the necessary contact information on it. What you will probably need to do will be to remove some items that were carried over from the HTML signature, but that don’t belong here - such as hyperlinks, extra spacing, etc. 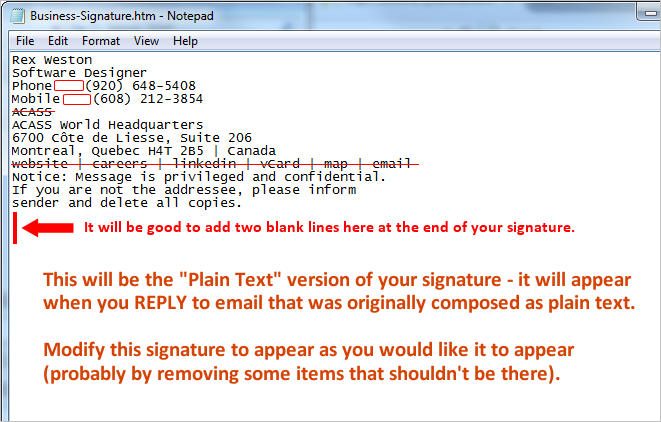 It is also a good idea to add two blank lines to the end of your plain-text signature. 14. ** DO NOT SAVE THIS FILE BY CLICKING SAVE OR BY PRESSING “CTRL-S”**. If you accidentally just “SAVE” this file you will have over-written your HTM file and will need to start over at step 1. 15. Now you should be back to seeing your save dialog. You MUST LEAVE THE FILE NAME THE SAME AS IT WAS but change the file extension to .txt - you will probably have to type “.txt” to do this. Set the “ Encoding” to “ ANSI”. 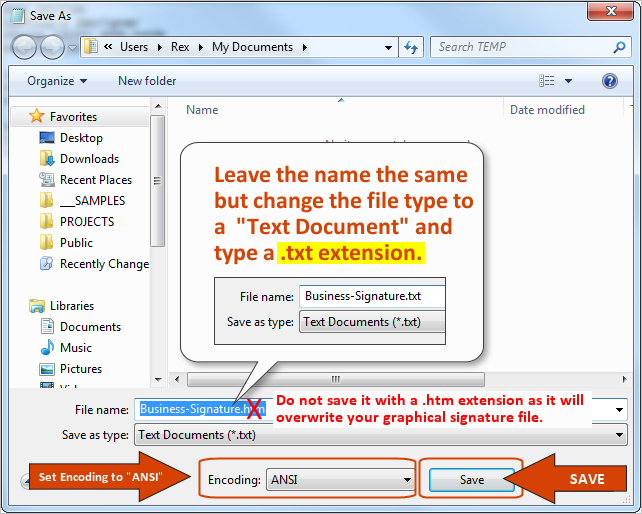 Once you have the file set to save as a Text Document (.txt), click SAVE. 16. Close Notepad and the folder that has your signature files in it. You’re now finished installing the Plain-Text version of your signature - there’s nothing more to do.